The “Return to Antikythera” international research team discovered a human skeleton during its ongoing excavation of the famous Antikythera Shipwreck (circa 65 B.C.). The shipwreck, which holds the remains of a Greek trading or cargo ship, is located off the Greek island of Antikythera in the Aegean Sea. The first skeleton recovered from the wreck site during the era of DNA analysis, this find could provide insight into the lives of people who lived 2100 years ago. Led by archaeologists and technical experts from the Hellenic Ministry of Culture and Sports and Woods Hole Oceanographic Institution (WHOI), the team excavated and recovered a human skull including a jaw and teeth, long bones of the arms and legs, ribs, and other remains. Other portions of the skeleton are still embedded in the seafloor, awaiting excavation during the next phase of operations. The Antikythera Shipwreck is the largest ancient shipwreck ever discovered, possibly a massive grain carrier. It was discovered and salvaged in 1900 by Greek sponge divers. In addition to dozens of marble statues and thousands of antiquities, their efforts produced the Antikythera Mechanism —an astounding artifact known as the world’s first computer. In 1976, Jacques-Yves Cousteau and the CALYPSO crew returned to the wreck and recovered nearly 300 more objects, including skeletal remains of the passengers and crew. The skeleton discovered on August 31, 2016, is the first to be recovered from an ancient shipwreck since the advent of DNA studies. Ancient DNA expert Dr. Hannes Schroeder of the Natural History Museum of Denmark in Copenhagen, hastened to Antikythera to view the remains. Once permission is obtained from the Greek authorities, samples will be sent to his laboratory for a full suite of analyses. If enough viable DNA is preserved in the bones, it may be possible to identify the ethnicity and geographic origin of the shipwreck victim. “Against all odds, the bones survived over 2,000 years at the bottom of the sea and they appear to be in fairly good condition, which is incredible,” said Schroeder. 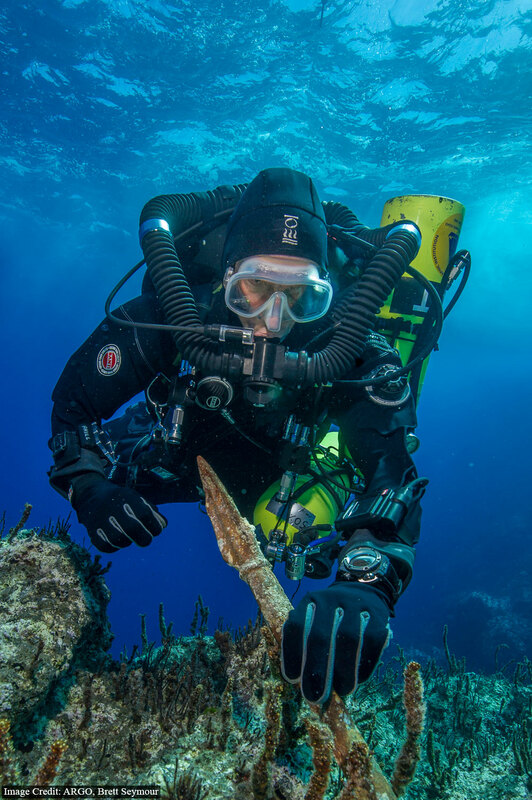 The Antikythera research team generates precise three-dimensional digital models of every artifact, allowing discoveries to be shared instantly and widely even if the objects remain on the sea floor. Several 3D models of the skeletal remains are available for researchers and the public to view on our devoted webpage. The project is supported by corporate partners Hublot (official diving watch and technical support), Autodesk, Cosmote (official telecommunication sponsor), Costa Navarino Resort (helicopter support) and private sponsors Swordspoint Foundation, Jane and James Orr, the Aikaterini Laskaridis Foundation, the Domestic Property Committee of Kythera and Antikythera, the Municipality of Kythera, and private sponsors of WHOI. The research team consists of archaeologists Dr. Theotokis Theodoulou and Dr. Dimitris Kourkoumelis (Hellenic Ministry of Culture and Sports); Research Specialist Dr. Brendan Foley (WHOI); archaeologist Alexander Tourtas; professional technical divers Edward O’Brien (WHOI), Philip Short, Alexandros Sotiriou, Nikolas Giannoulakis, and Gemma Smith; videographer Evan Kovacs; documentary director Michalis Tsimperopoulos; supported by Michalis Kelaidis, Dimitris Romio, and Dimitris Manoliades. The robotic mapping survey was conducted by Prof. Stefan Williams, Dr. Oscar Pizarro, and Christian Lees from the Australian Centre for Field Robotics, University of Sydney. U.S. National Parks Service underwater photographer Brett Seymour and archaeologist Dr. David Conlin volunteer their time and expertise. The Return to Antikythera project is supervised by the Director of the Ephorate of Underwater Antiquities Dr. Aggeliki Simosi and is under the aegis of the President of the Hellenic Republic Prokopios Pavlopoulos. The first phase of this year’s Return to Antikythera excavation produced fabulous results! More soon from the Hellenic Ministry of Culture and Sports. Meanwhile, 2016 is the 40th anniversary of the Ephorate of Underwater Antiquities, and the Jacques Cousteau and Lazaros Kolonas investigation at Antikythera. Left to right, 1976: Jacques Cousteau and Lazaros Kolonas with Chief Diver Albert Falco and Ivan Giacoletto. 2016: diving ops manager Phillip Short, EUA archaeologist Theotokis Theodoulou, chief diver Alexandros Sotiriou, and archaeologist Brendan Foley. In this image, they are pictured with Chief Diver Albert Falco and Ivan Giacoletto. In tribute to those great men, some of our team recreated the same image with some of the newly recovered artifacts: (left to right) diving ops manager Phillip Short, EUA archaeologist Theotokis Theodoulou, chief diver Alexandros Sotiriou, and archaeologist Brendan Foley. Section of a bronze spear recovered that would have belonged to a larger-than-life size statue. The team created history today, with Ed O’Brien from Woods Hole Oceanographic Institution being the first person to dive (pilot) the Exosuit in the deep blue water off Antikythera. 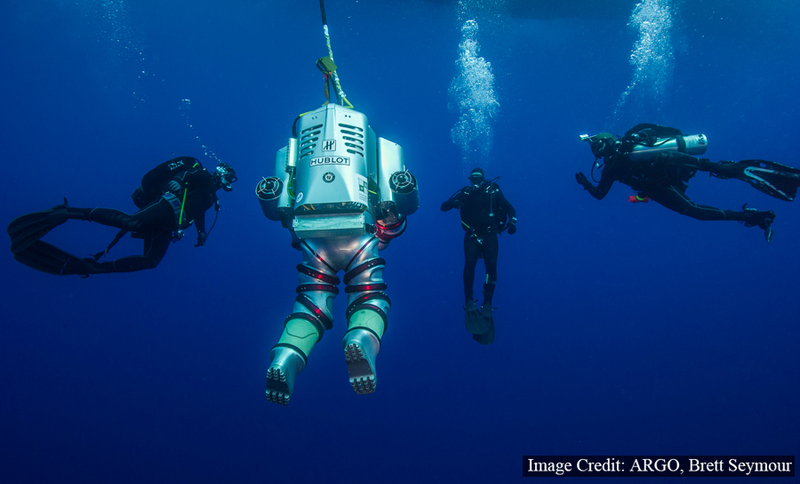 Ed O’brien creates history, being the first person to dive (pilot) the Exosuit in Antikythera. 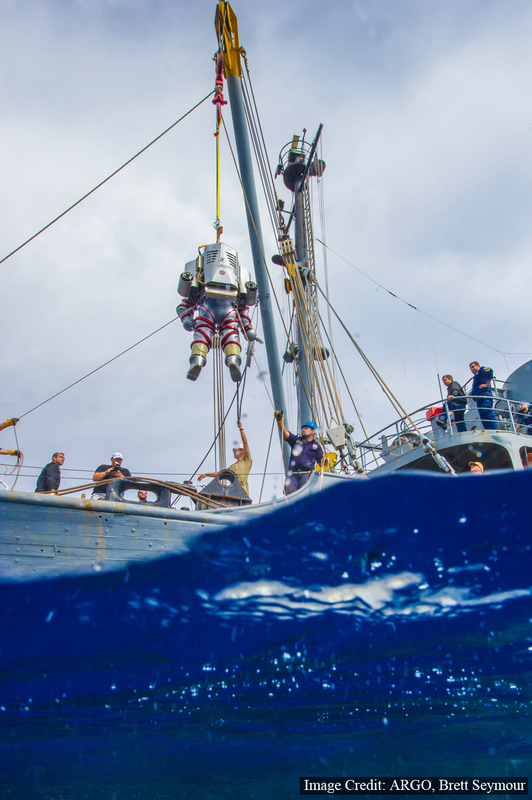 We’ve been hampered by bad weather which created delays in the deployment of the Exosuit, but everything came together today, with the Exosuit being successfully deployed from the Hellenic naval vessel, HN THETIS. 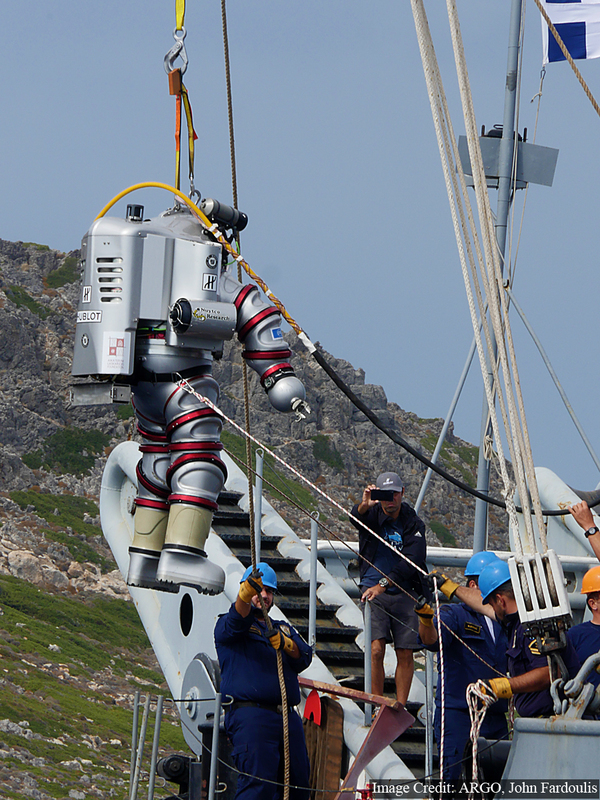 Creating history, with members of the Hellenic Navy Seal (O.Y.K) team providing in-water support for the Exosuit. 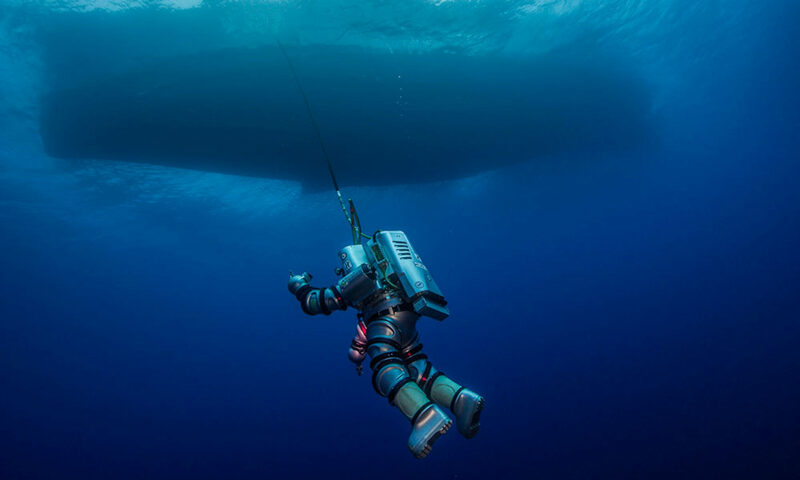 Hellenic Navy diver/Exosuit pilot Fotis Lazarou was the first Greek person to dive the Exosuit in Antikythera.